I shot a video of this unboxing over the weekend, only to find that the results were way too dark in this sunless, rainy weather. Turns out it's the Sony Handycam's fault, while my Canon DSLR is a far better choice for videos under poor lighting conditions. Lesson learnt. 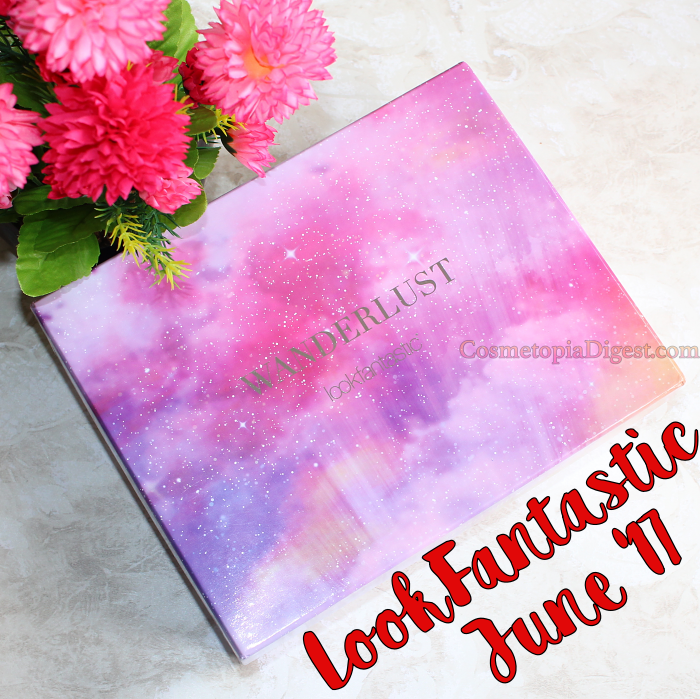 LookFantastic's June 2017 beauty box is the Wanderlust edition - obviously containing travel essentials. The box design is one of the prettiest till date. 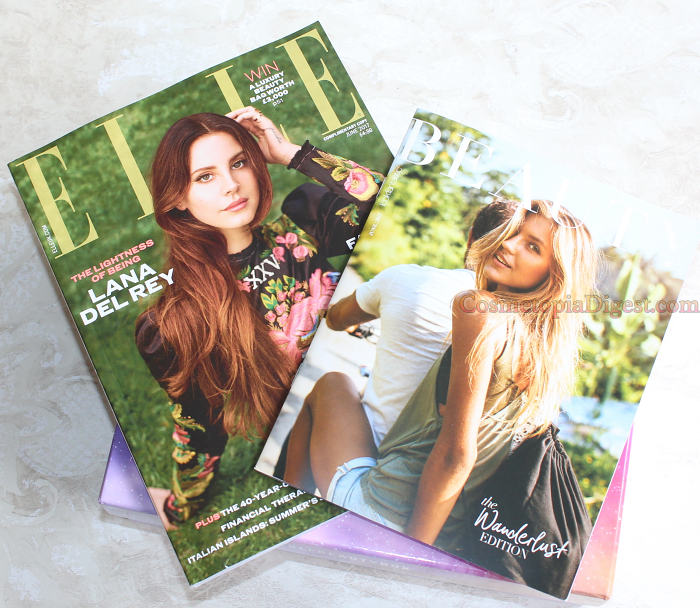 Size has gone up as well, and now the box itself accommodates the Elle UK magazine for the month. Scroll down for the contents of the LookFantastic Beauty Box for June 2017. I've used these before. These contain a blend of Lactic and Glycolic acids (chemical exfoliants). My skin is now used to stronger acid formulations. I'll be using these on days after scar revision procedures, when my skin needs gentler treatment. I have a full-sized bottle of this luxurious, nourishing mist. The blend of sandalwood, rosewood and lemon smells amazing. I use it to refresh my skin on sultry days. A great choice for travelling. This contains neroli oil, spruce knot and bergamot to balance out sebum and to give a healthy glow to the skin. Something in Balance Me products always breaks me out - I suspect it is the high concentration of undiluted essential oils. This goes to my Mum for her travel next week. I adore Kerastase's masques and conditioners. The shampoos mostly contain sulphates, so I use them for removing product build-up, once in a while. That's how this one will be used. While I'm a fan of ModelCo makeup, this shade is even paler than a foundation for me! Ah well, you cannot help the shades chosen in beauty boxes. It would be a great shade for a paler person. Goes into giveaway box. Believe it or not, LookFantastic has sent out this exact highlighter at least two times in the last year. It is translucent and suitable for all skintones, but three jars of a product is a bit much - also goes into the giveaway box. 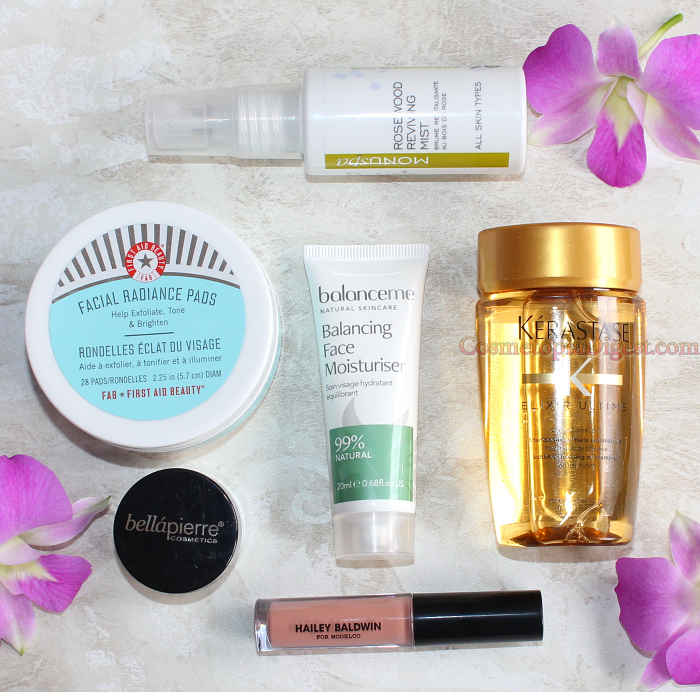 The design of this month's LF Beauty Box is one of the best I've seen till date, and I've been a subscriber since they began back in September 2014. I'm happy to see the inclusion of two makeup products in what is otherwise a skincare-centric box, but I'm not a fan of the product repetition. The Monu Mist, the Kerastase shampoo, and the FAB pads are top choices. A mixed bag, all in all, with three full-sized products. To know how each product works, you're going to have to wait until I try them out over a reasonable trial period - this is only an unboxing post! To subscribe go here - LookFantastic ships worldwide. Each box costs £15, but longer subscriptions cost as low as £13, without any pre-payment. Stay tuned for the next box!